Kik Messenger is a well-known application used by many iPhone and Android users. In case you want to deactivate the Kik from your device, it’s better to note that the app is best Messenger app anyone can use to chat anonymously with their Android and iOS device. If you are already a user of Kik, then you are already aware of this. Firstly, disabling your Kik account means that you won’t be able to log in the account. As a result, you no longer have the opportunity to chat with your friends, and people won’t be able to find you on Kik. Also, deactivating Kik account means that you won’t be able to receive emails, information and so on from the platform. Firstly, uninstalling Kik means you are removing the application from your device. Therefore you can still receive messages on your account depending on the configuration of the system. Messages will be held by the system for a while, let’s say 1 week, and if they are undelivered, it will be deleted automatically. Once this is done, you can no longer receive the message whenever you come online. You can still receive messages on your Kik account even after uninstalling provided you haven’t blocked anyone. The account is moved from Kik service. The Kik app is removed from your phone. It’s nothing about Kik account. You no longer login into your account. You can login your account when you install the app again. You can no longer receive messages and other information. You can still receive messages provided you the system has not deleted them. No one can find you on Kik. People can still find you on Kik. iMyFone Umate Pro iPhone Data Eraser for Win or for Mac is the ultimate iPhone eraser which will completely overwrite iOS data and make them 100% unrecoverable. With more than 25 analysis technologies, it will show all the existing and even the previously deleted files to erase. It keeps you away from privacy leak. Erase Private Data: Preview and select Kik history to erase history, including messages, photos, videos, etc. 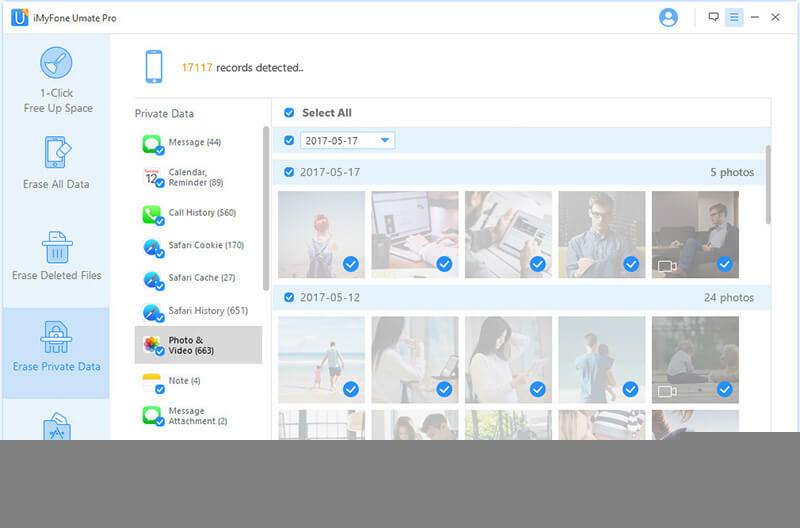 Erase Deleted Files: View and wipe all deleted Kik data which are still unrecoverable. Erase Private Fragments: Complete erase all the traces or fragments left by Kik, Snapchat, WhatsApp, Facebook, Twitter, and 10+ more 3rd-party apps. Clear Cache: Clear your Kik cache and other app cache all together for free. Step 1: After you have downloaded iMyFone Umate Pro iPhone Data Eraser, plug in your iPhone to your PC with a USB cable. You have to trust your PC if you're connecting to PC for the first time. Step 2: After you have connected your device to PC, select the Erase Private Data mode. Press the Scan tab to let it analyze your device. Step 3: Preview the Kik history and check unwanted files to erase. iMyFone Umate Pro iPhone Data Eraser are recommended by lost of moted media, like MacWorld, iPhoneinCanada, APPKED, etc.